The concept of the Stability Union seems to be getting traction. Reuters: "We are working intensively for the creation of a Stability Union," the German Finance Ministry said in a statement. "That is what we want to secure through treaty changes, in which we propose that the budgets of member states must observe debt limits." The discussion seems to focus around the full EU Treaty ratification with all the eurozone countries involved. The thought is that if member states sign on to strict austerity (effectively as prescribed by Germany), the ECB would be more amenable to supporting the eurozone bond market. It is hard to imagine this could be a quick process, given that it will involve member states' parliamentary maneuvering. 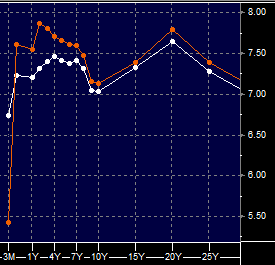 The Italian yield curve flattened in response, with inversion between the ten and the two year notes now at around 30bp. The short-covering rally is extending across major equity markets - part of it driven by rumors that the Fed is gearing up for QE2 (more on that later). However financial stress indicators continue to stay elevated. It's hard to fully trust some of the confusing language coming out of Europe. 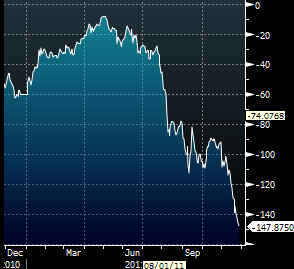 The chart below is the US 2-year swap spread which is maybe a basis point off the high. 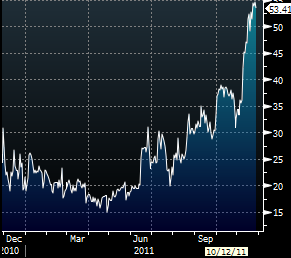 Similarly the 3-month EUR/USD currency basis swap spread continues to widen, marching toward -150. The financial system, particularly in Europe is still quite stressed. This is not going to change until we see a concrete and plausible proposal with full details emerging from the key members of the eurozone.